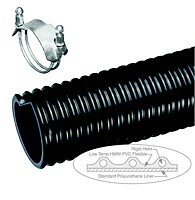 Series HS1231, 1234 and 1236 Tundra-Air® Low Temperature PVC Air Hose. PTFE Gaskets White Virgin 1/16"
Ureflex 1 Polyurethane-Lined Abrasion-Resistant PVC Material Handling Hose - 6 in. X 20 ft. - OD: 6.81 in. • Pneumatic conveying systems for powder, pellets or granular materials. • Sand/shot blast recovery line. Service life may vary depending on operating conditions and type of material being conveyed. • Smooth polyurethane lining - provides resistance to abrasion ... eliminates material build-up. • Black HMW PVC convoluted cover - formulated with static- dissipative compound ... also provides sub-zero flexibility. • Pneumatic Conveying - Pellets, Etc.